Home / Here to Hire / Start With Sigi! It’s time for my Monday post, and this week I’d like to highlight last week’s Career Friday topic. And that would be Sigi. If you’ve never visited the website, take my word for it, it is definitely worth your time. 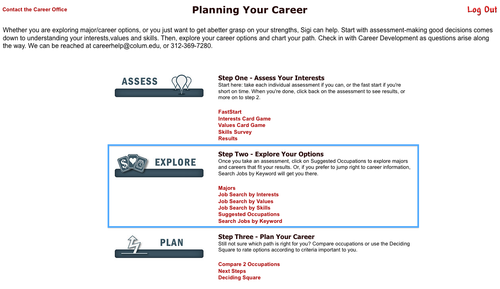 It is a career exploration and planning resource that evaluates the information that you give it through a series of quick, and actually quite engaging surveys. One survey even has a Solitaire layout, tricking you into thinking you’re procrastinating. But you’re doing exactly the opposite! First step is to create an account. Note: Use your loopmail address. Sigi is an outside source that Columbia has hooked up with, so they’re only going to recognize loopmail accounts. Once you take that step, Sigi will email you an activation code, which you will then use as your password to log in, using your loopmail address as the username. You will automatically be prompted to change your password. Change it to something you will definitely remember, like your favorite Pokemon or favorite high brow scientist, whichever end of the “maturity spectrum” you’d like to go with. Now it’s time to play! See how quick that was? Very quick. Don’t worry about it, just go ahead and click ‘Continue’. But only after basking in the throwback 90’s layout. It’s beautiful, isn’t it? Go ahead and click FastStart and then click Begin in the top right corner. And off you go! A few of the prompts will let you choose more than one answer, but they won’t tell you that. So make sure to take the time to pay attention to what you’re answering. At the very end it will ask you what your major is. Sometimes it will be easy to locate your focus. But personally, I didn’t select one since I am a double major and value both majors equally, not putting one over the other. But in the end it is all about preference! On the next page go ahead and click in the top right corner. At this point, only the only the ‘FastStart’ column will show results. The higher the green bar is on the scale, the more valuable that trait or skill is to you. These are values that, if instilled in the workplace you are in, will make it more rewarding for you. There’s a lot going on and a lot to take in, so I’ll boil it down to a few notable things. The check marks: On the left side of the page, you can click on those check marks, which will widdle down the list of jobs to the right, making it a more defined search. Sunshines and leaves: Note that the little images of the suns and leaves mean something. You will find them placed next to certain jobs that they pertain to. I found this particularly useful. What even is that? : Never heard of the job before? Go ahead and click on it! It will bring you to a page with information on what the job is all about. 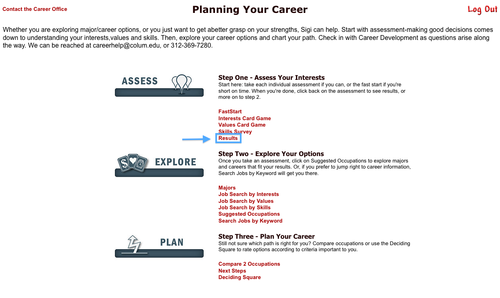 You can always go back to the ‘Planning Your Career’ page and retake any of the assessments if you feel like they don’t correctly portray your interests and you aren’t satisfied with the job results. However, if that’s the case, I’d say give them a shot! Do some research outside of Sigi. Print out a list of a few of the recommendations and make an appointment at the Portfolio Center to talk about them. Think outside the box, all of that fun stuff. This is just the beginning of Sigi. Go ahead and play around with it and consider new things that you might not have considered before. You never know what you’re truly good at until you give it a shot.